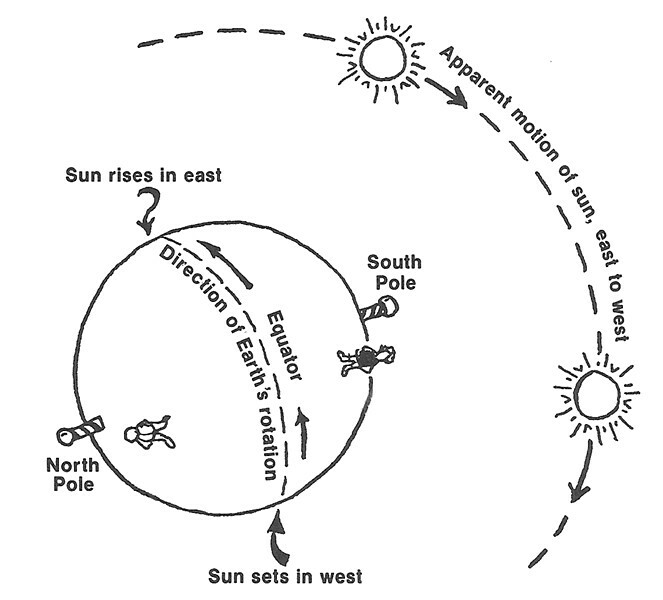 For a northern hemisphere observer looking south toward the sun, the sun appears to move from left to right, creating what we think of as "clockwise" shadows. South of the equator the sun appears to go from right to left. Civilization, I was taught, arose on four great rivers of the world: the Nile, the Huang He (Yellow), the Indus and the Tigris-Euphrates (which become one, 50 miles upstream of the Persian Gulf). Notice anything? They're all in the northern hemisphere. As a result, our global culture is hemicentric: North rules. • South would normally be at the top of maps, while compass needles would point south, instead of north. They do now, of course (i.e. they have two ends), but the convention is to favor the north tip by painting it red or some other distinctive color. • The direction "clockwise" would be opposite from how we now define it. Early clockmakers living in the northern hemisphere mimicked the direction of rotation of a sundial's shadow. Had they lived south of the equator, they would have had the hands of their clocks rotate (what we think of as) "counterclockwise." (See graphic). • We'd have different zodiacal constellations. Viewed from, say, Australia, Orion the Hunter stands yoga-like on his head, while Leo the Lion lies passively on his back, paws in the air. • Spring, when new buds "spring" from branches, would run from September to December, while fall (as in leaves falling) would last from March to June (as happens now in the southern hemisphere). Winter (cognate with "wet") and summer (related to "sun") would switch, too. • The art of long-distance navigation might have arisen later. North of the equator, early sailors navigated by the Pole Star (Polaris) which, because it lies close to the celestial north pole, appears to stand nearly still in the sky as the other stars rotate around it. Navigating in the southern hemisphere, where Polaris is below the horizon, is trickier because the closest bright star to the celestial south pole (Miaplacidus) is a full 20 degrees away. Lacking a fixed point of reference, long distance mariners might have been less eager to sail out of sight of land than their northern-hemisphere counterparts. You can take this speculation to extremes. Would faucets turn in the opposite direction? How about rotary phones? (Remember them?) Would we drive on the opposite side of the road? Would Republicans veer to the left? Maybe our 90 percent predilection for right-handedness would be reversed, with the 10 percent minority being righties (northpaws?). Barry Evans (barryevans9@yahoo.com) veers to the left while thinking he's right. His latest book, the most recent 18-months worth of Field Notes (Son of Field Notes) is at Northtown Books and Eureka Books.